Yikes, when I opened up Blogger and saw that I hadn't posted since Tuesday, I was taken aback. I didn't think I was doing too bad but here I am flirting with being a week behind again. Alright, let's see how much we can get through. On Thursday Morning, I got a special surprise when Aunt Darcy, Aunt Kelly, Grandma & Grandpa Davenport all came over before I even left for Miss Anne's. Sweet! AD, AK and Dad all left to go down to the Big 12 Tournament but G&G D stuck around to play for a little while before eventually taking me over the MA's. So fun! Mom made an afternoon trip downtown as well so Grandma Davenport picked me up from MA's too and we spent the evening playing - including a dinner trip to Sutera's. I actually spent the night at G&G D's, along with my sisters but we were all in for a surprise when we woke up to find Dad had spent the night as well. TWIST! After Dad got me ready, he piled my sisters and me into the car and dropped me off at GmaH's for the day. I was pretty sure it was Mom's Friday off but apparently she has work to do. Where's the fable? It's all good though because GmaH and I have tons of fun together. We kept up with our favorite tradition of going to lunch at Nordstrom and visiting Aunt Abby. Friday could almost have be classified as a Spring day so after GpaH got home, we all took a stroll outside to see the early risers in their flower bed. I recommend clicking on the fourth picture in this group so see a larger version. 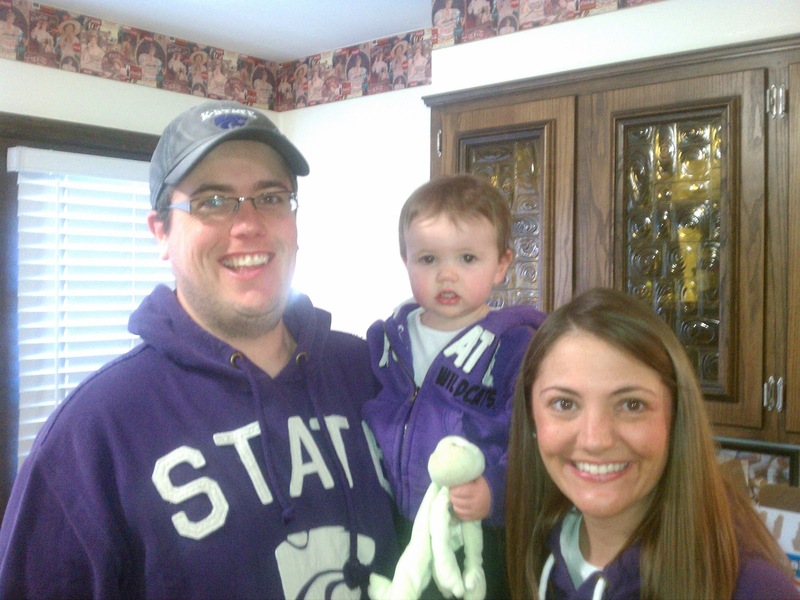 Not only is the flower purple (GO STATE!) the picture is really pretty artistic. You can see winter slowly giving way to Spring. Awesome right? Okay, I had a super busy weekend which means I have like a thousand more pictures to go through but it also means that I'm exhausted... so you'll just have to wait until the next post. Cheers!